I wanted to share this tablescape with you now, because I have a few more. I gave two dinner parties with 10 and then 11 people this week. I loved the white and gold so much, I thought I would use this theme. The plates are from Macys. Gold goblets from Zgallerie with Horchows' gold flatware. I found the pretty snowflake napkin rings at Target. We recently bought a few more snowflakes to hang from the chandelier. I love dressing the chandy, it makes the room look so elegant. Led white lights sit in the gold hurricanes. They give off a nice glow. They call them fairy lights. The picture to the right with the two small Christmas trees is from the family room. The table sits in front of the picture window with the waterfall outside. My husband always dresses the arbor with icicle lights. The new flocked Christmas we bought this year. I decorated it in gold ornaments and a white angel. Happy Holidays everyone. Christmas will soon be here. 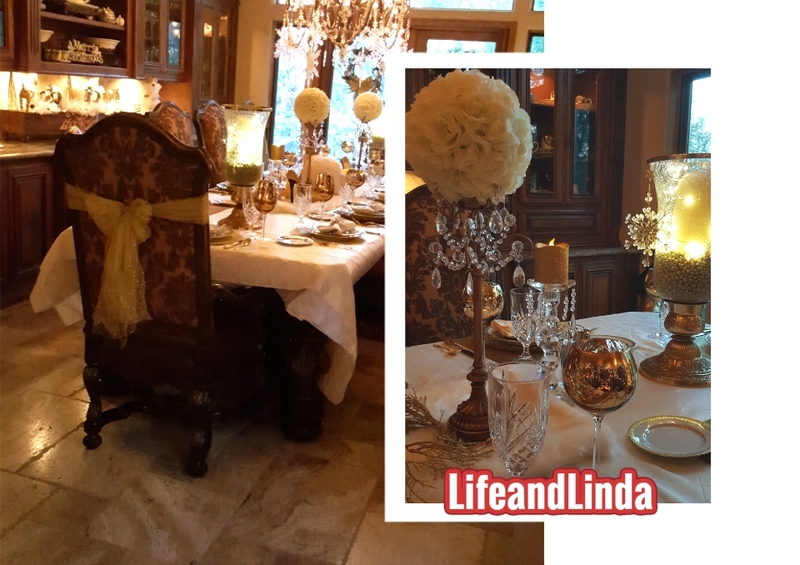 I wanted to share this post tonight, because I have an angel tablescape to show you soon. 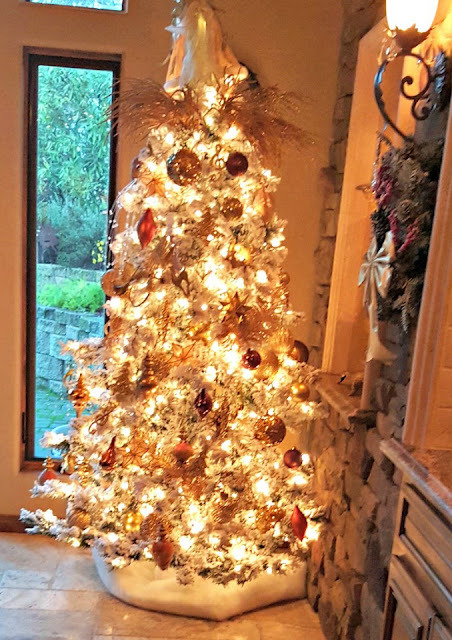 That Christmas tree is spectacular! WOW! I love the White & Gold Tablescape! It's beautiful...and so is everything else. I am also loving that polar bear on your table...he is adorable. Oh how beautiful! Love that polar bear on there too! 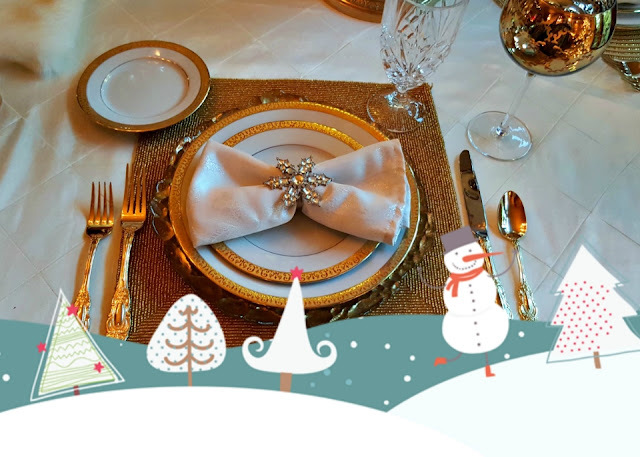 The pretty snowflake napkin ring is beautiful. This is beautiful and magical! Linda, your golden table is exquisite. 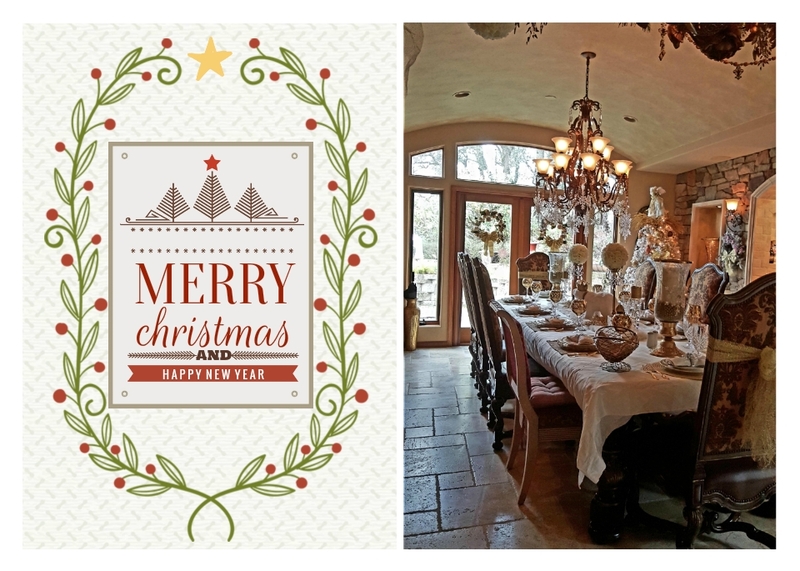 Love the centerpiece with the polar bear and and snowflakes floating above. I know your dinner guests enjoyed the dinner party. I feel like I repeat myself in saying your tablescapes are beautiful every time you post a new one, but they all are! I love the gold silverware. Soo elegant! I adore all the gold! Just beautiful. Have a wonderful Christmas, Linda. Merry Christmas! Thanks for sharing at Home Sweet Home! I'm finally getting a few minutes to visit blogging friends! 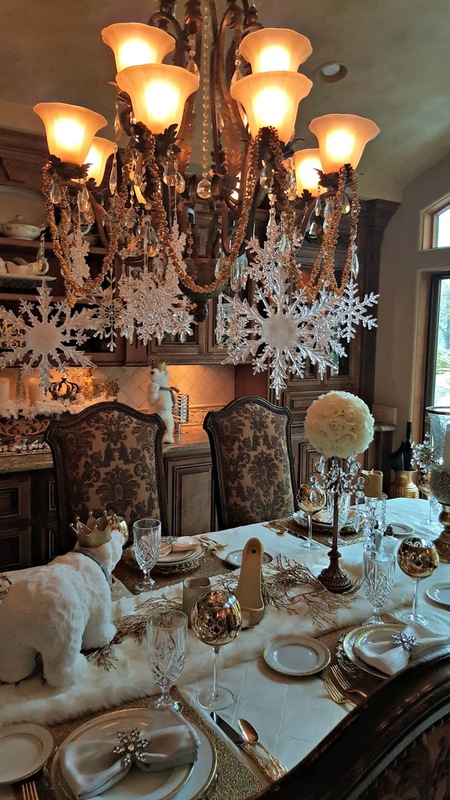 I love white and gold at Christmas and this tablescape is just gorgeous, Linda. 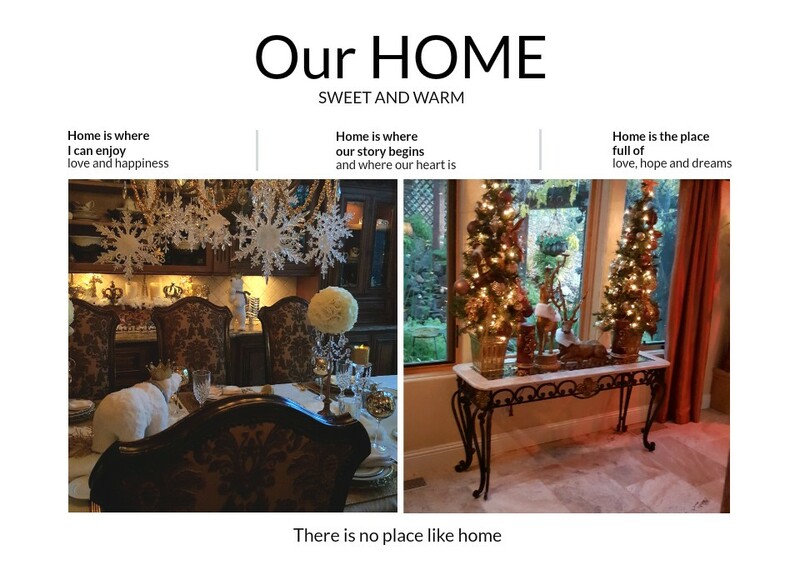 Your home is super festive and fun - truly beautiful.